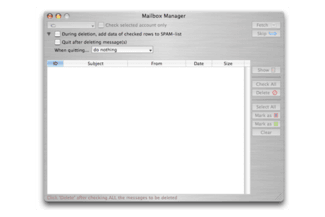 Mailbox Manager is a program that offers the ability to easily manage several email accounts. It has been developed by AsramSoftware and was designed to be compatible with Mac computers. As mentioned above, Mailbox Manager' s main function is to allow dealing with multiple email accounts at a time. The user is offered the opportunity to view incoming, sent or deleted messages from various accounts on a single interface. The handling of Mailbox Manager is quite easy. The user is given specific fields where to insert details of each email account and the software does the rest. That is to say that there is no more complex configuration as far as the account, password and POP3 parameters are inserted. This application appears to be very practical. Indeed, it allows previewing incoming messages without accessing to the email account. The user only needs to access the account once he considers the message as an important one. This software also includes a system for managing emails. It is allowed to mark messages as spams, delete, block messages and still many other functions. Mailbox Manager can be downloaded for free. It is easy to handle and its execution does not impact on the computer's performance. Latest update on June 9, 2016 at 05:52 AM.